Repair, installation, upgrade machines and their elements: lifting facilities (individual nodes using welding, cranes of all types of lifting 630 tons inclusive. 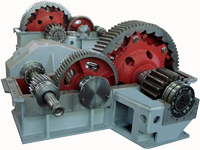 Selling gear with cylindrical and bevel gears, planetary and parts. Manufacturing under the order.